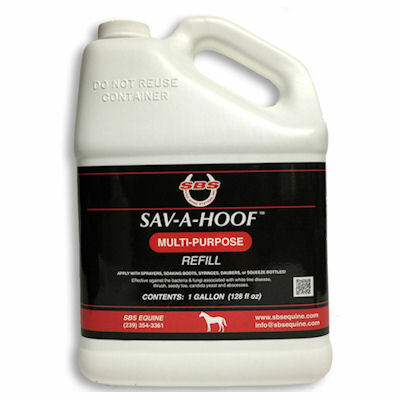 Sav-A-Hoof Spray (SBS Equine Products) is a convenient, easy to apply spray formula that fights White Line Disease, Seedy Toe, Thrush, stubborn Candida Yeast, Fungus, Mold, Anaerobic and Aerobic Bacteria. It can be used for prevention as well as treatment. Spray on coronary band, hoof wall, sole, nail hole, under shoes and pads. Binds to hoof protein and forms a barrier against infection. When applied to the hair line or coronary band it will travel down horn tubules and seek out infection, even behind wrapped or taped feet. Safe for horses, humans and the environment.